An animal missing from Belfast Zoo for more than five weeks has been found safe and well and returned to its enclosure. 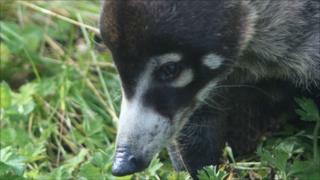 The white-nosed coati from Belize escaped from the north Belfast site on Monday 19 July. On Saturday, a team of zoo keepers and the zoo vet were able to retrieve the escapee from a tree within the zoo grounds. Zoo manager Mark Challis said the coati was in good health. "We have been vigilant in our attempts to locate the missing coati and the entire zoo staff are thrilled to have her back where she belongs. "We were confident that she would not have strayed too far from the zoo site, and after several positive sightings within the area we were all hopeful that she would be returned safely to our care. "The coati has now had a veterinary inspection, is in good health and is settling back in with the other coatis in the zoo," he said. The mammal was being held in quarantine after just arriving at the zoo. It had been hoped the female would take part in a breeding programme with several other coatis recently imported. The coati is an omnivorous animal and it was likely to be surviving on fruits, berries and leaves as well as mice and small birds.